American Honda Motor Co., Inc. today reported a new April sales record of 148,829 Honda and Acura vehicles, an increase of 14.4 percent for the month. 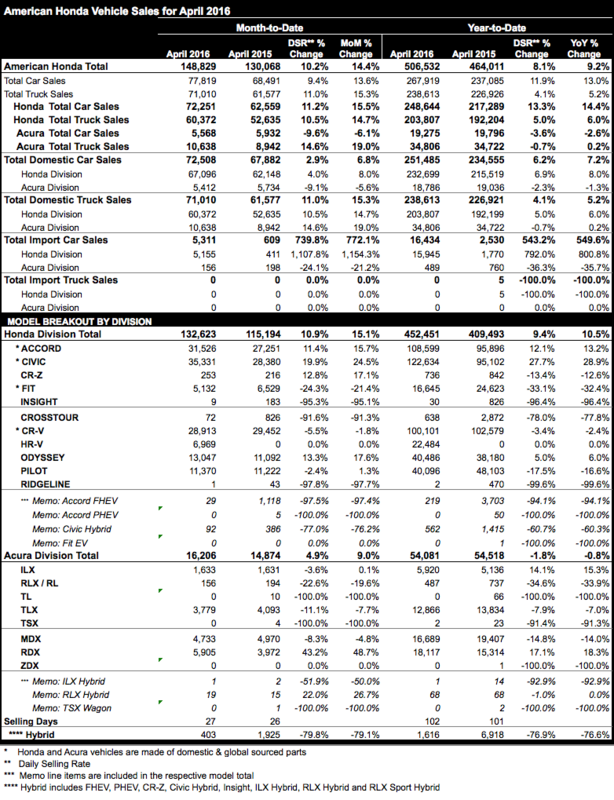 Year to date American Honda sales reached 506,532, up 9.2 percent. The Honda Division set a new monthly record with 132,623 units sold in April, an increase of 15.1 percent compared to April 2015 with year to date sales up 10.5 percent. Acura Division sales totaled 16,206, an increase of 9 percent in April with year to date sales reaching 54,081. With strong and balanced demand across the lineup, Honda broke several records in April including posting best ever April sales results and setting a new light truck record. Honda cars also notched healthy gains with record sales of the all-new Civic along with strong Accord sales. Civic continues to dominate the compact car segment with sixth consecutive month-over-month sales increases, up 24.5 percent to a new April record of 35,331. Accord maintained strong demand as April sales totaled 31,526. The model experienced a 15.7 percent increase compared to April 2015 sales. Honda light truck sales set a new April record of 60,372 units. Odyssey minivan sales totaled 13,047 sales in April, an increase of 17.6 percent, while Pilot boasted sales of 11,370, despite tight inventories. Acura strengthened its position in the luxury vehicle segment as the brand experienced strong sedan and record light truck sales in April. The Acura light truck lineup posted its best April sales on record sales of the RDX luxury SUV. Acura sedans racked up sales of over 5,500 units on the strength of the ILX gateway sedan and TLX performance luxury sedan. The RDX continues to show month-over-month sales increases, leading all Acura models in April and setting a new all-time monthly sales record of 5,905 units, an increase of 48.7 percent in April. The ILX gateway sports sedan continues to catch the attention of Millennial buyers as April sales totaled 1,633 for the month. The ILX has captured a higher rate of under 35 year old buyers than any other vehicle in the entry-luxury sedan segment since 20101. 1 Based on IHS Automotive, Polk new U.S. retail vehicle registrations by volume for Luxury Traditional Subcompact segment and age of household data for 18-34 year olds for CY2011-2015 cumulatively.